The Equine Judging Team included, from left, McKenzie Richards and Bryan Daehling. 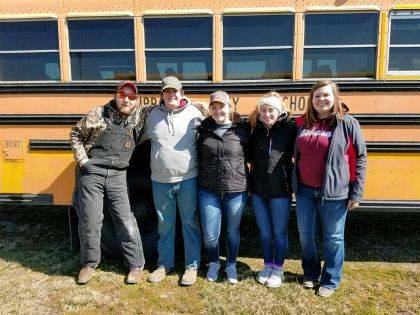 The General Livestock Judging Team included, from left, Justin Preece, Conor Thomas, Peyton Tener, Kirstin Lewis and Janie Wallace. 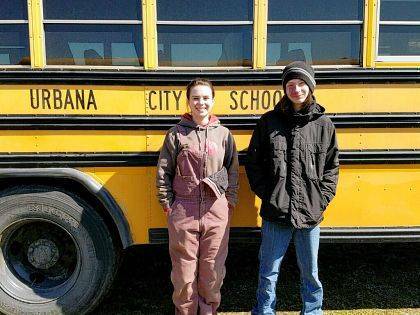 Urbana FFA members took part in the Miami Trace Invitational and Ashland Invitational, where several teams participated in different judging contests. Among these contests were General Livestock and Dairy Foods, Equine. These competitions promote leadership and life skills for the students involved. All students take part in practices before the contests to learn the skills they will need for the competitions. Teams are made up of up to eight members, and are given an accumulative score on the three highest ratings. In the Dairy Products Contest contestants identify and score milk defects. They must also ID different cheeses, do CMT scores on samples of milk, score and ID defects on milker units, score sediment pads, and tell the difference between Dairy and Non-dairy products. Finally they must take a test based on the dairy industry and trends within the industry. The participants from Urbana were, Rebecca Preston, McKinley Preece, Brittney Fiest 15th, Jackson James, Levi Hunter, Olivia Maurice, Kaylin Lance, Lexus Greene, Kendra Baccus, Nick Crumley and Jessica Salyers, nand Zackery Collins. The team placed 5th overall.At the Ashland Invitational the Dairy Products contest members are as follows: Rebecca Preston 10th, Brittney Fiest 13th, McKinley Preece 15th, Olivia Maurice 18th, Nick Crumley 19th, Lexus Greene, Jessica Salyers, Zack Collins, Kaylin Lance, Kendra Baccus . The team placed 3rd overall. The General Livestock students also participated. They had judge two classes of beef, swine, and sheep based on market and breeding characteristics. They also have three female selection classes and two paper scenario classes. The team placed 38th overall.The team placed 29th overall at Ashland. The Equine Management contest is an educational activity designed as a practical method of teaching students current horse evaluation and selection techniques in addition to developing management skills necessary for success in the equine industry. The team placed 32nd overall. The team placed 19th overall, with participants McKenzie Richards 26th and Jesse Craig 78th at the Ashland Invitational. During Meat contests students are asked to identify retail cuts of meat, along with the primal cut, and what species they are from. They must also answer questions on classes of meat, and place those classes based on fat content, leanness, and texture. Finally the team had to take a test on meat science and the meat industry. At the Ashland Invitational members Savannah Copeland 11th, Ashlyn Dunn 16th, Taylor Cordial 23rd placing the team at 5th overall. Congratulations to all the contestants on a job well done.